Rose Hill Cemetery, Cleburne, Texas, U.S.
Robert Bernard Anderson (June 4, 1910 – August 14, 1989) was an American administrator and businessman. 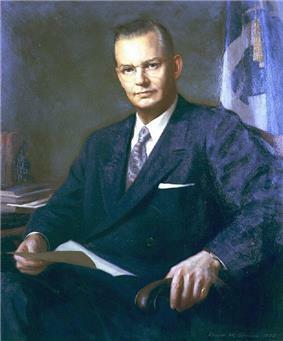 He served as the Secretary of the Navy between February 1953 and March 1954. He also served as the Secretary of the Treasury from 1957 until 1961, and was one of President Eisenhower's closest confidants. Anderson was born in Burleson, Texas on June 4, 1910, to Robert Lee Anderson and his wife Elizabeth Haskew "Lizzy" Anderson. He was a high school teacher prior to entering the University of Texas Law School, from which he graduated in 1932. He thereafter engaged in political, governmental, law and business activities in the state of Texas. Upon leaving the University of Texas School of Law in 1932, Anderson soon became an Assistant Attorney General for the State of Texas where he worked in 1933-1934. By 1934, he moved onward to become a State of Texas Tax Commissioner. By 1939-1940, Anderson pursued opportunities within the private sector; he and two other partners purchased the City of Austin-based KTBC radio station from the Texas Broadcasting Company. Not able to increase KTBC's broadcasting power from the Federal Communications Commission (FCC), the three partners then sold KTBC to Lady Bird Johnson in January–February 1943; she was the wife of U.S. Representative - and future Senator and U.S. President - Lyndon B. Johnson. Anderson married Ollie Mae Rawlins on April 10, 1935. They couple had two sons, Gerald Lee and James Richard. The Anderson family later moved to Cleburne, Texas. Ollie Anderson died in Greenwich, Connecticut of Alzheimer disease on May 31, 1987. During his time as Navy Secretary, he ended the last formal vestiges of racial segregation in the Navy and advocated the force levels and technological advances necessary to maintain a flexible defense strategy. In May 1954, Anderson left his Navy post to become Deputy Secretary of Defense. He received the Medal of Freedom in 1955. From 1957 to 1961, he served as President Eisenhower's Secretary of the Treasury. 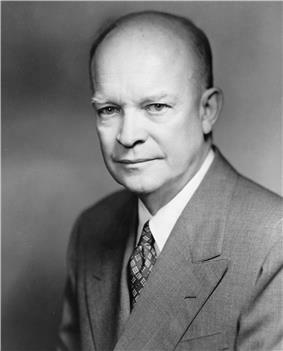 Eisenhower was particularly impressed by Anderson's abilities, believing him to be more than capable of being president himself, and he named him as one of his leading choices to be his running mate in 1956, should to be Vice-President Richard Nixon have accepted Eisenhower's recommendation that he leave the vice-presidency in order to serve as Secretary of Defense. However, Nixon opted to remain on the ticket with Ike. As 1960 approached, Eisenhower acknowledged that Nixon no doubt had the Republican presidential nomination sewn up, but he privately pressed Anderson to enter the primaries and challenge Nixon, but Anderson declined. Once Nixon was nominated, Eisenhower suggested that he select Anderson as his running mate, but Nixon chose Henry Cabot Lodge, Jr. instead. In 1959, as Secretary of the Treasury, Anderson supported the creation of the International Development Association, after pressure from then-Senator Mike Monroney (D-Oklahoma). After leaving office, he was active in business, investment and banking affairs, and, during the 1960s, carried out diplomatic missions on behalf of President Lyndon B. Johnson. Anderson died of throat cancer following his cancer sugery in New York City on August 14, 1989. He was buried in Rose Hill Cemetery in Cleburne, Texas. ^ Matter of Anderson, 142 A.D.2d 498, 536 N.Y.S.2d 765 (January 12, 1989).